You need to stay safe and stay aware of fire hazards in your home that can ruin the fun. Here are some residential fire safety tips you should follow this holiday season. 2018 is almost over. What better way to celebrate than to gather around your family with a good meal, gifts, and laughter? But you need to stay safe and stay aware of fire hazards in your home that can ruin the fun. Here are some residential fire safety tips you should follow this holiday season. Your home is full of electronics. After all, whether they are for entertainment or personal assistant purposes, you shouldn’t leave them on all the time. Even standby mode can present the risk of an electrical fire. Also, keep an eye on the appliances and electrical gadgets that you store in your kitchen. In all of the chaos of preparing a holiday meal, it’s even more likely that a fire will break out in the kitchen. That said, it might not always be because of the stove or the oven. Create a plan for what to do when a fire does happen. Then you need to practice your plan as often as possible, practicing the escape routes you outlined. That way, when your family members are all panicking in the heat of an emergency, you all know where to find each other when first responders arrive to answer your distress call. Sometimes you won’t know if there’s a fire unless your smoke detectors are working. Ensuring residential fire safety depends on knowing when smoke erupts. Put a smoke detector in all of the bedrooms, in the basement, in every hallway, up in the attic, and the kitchen. Then you might also want to consider adding fire alarms in your home. 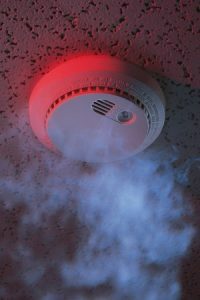 If you live in apartment complex, there might already be fire alarms on the ways, but this isn’t always the case for townhouses and single-family homes. One last residential fire safety tip is to keep fire extinguishers close at hand. There are times when water won’t put a fire out; instead, it will only make the fire worse. Fire extinguishers can control or defeat a fire – when used properly, they can contain a fire until firefighters arrive. Just be sure that you have the right fire extinguisher available, as there are different types meant to deal with different fires. This entry was posted on Friday, November 16th, 2018 at 3:25 pm. Both comments and pings are currently closed.